Gombak Selangor Quartz Ridge is part of the Tentative list of Malaysia in order to qualify for inclusion in the World Heritage List. I visited in a very hot day on March 2019. I actually stay not far from the quartz ridge (around 6 km) where I get to see it everyday from my condominium balcony. But I never have time, and most importantly, friend with the same interest to discover this interesting geological formation. So only recently I managed to tick off this tentative list. There are two entry points to start off depends on you fitness. 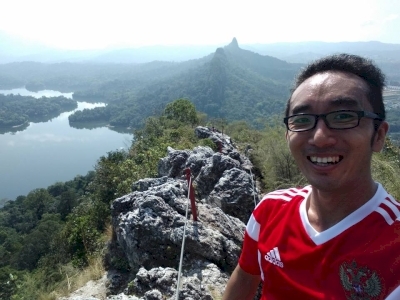 You can look for Kaki Bukit Tabur (West) on the GPS as this is the easy trail and you can go for the East one for advanced climbing. After ascending for around 10 minutes through the forest, you will find a lot of quartz on the ground, all over, and actually this will be the trail you'll follow on the rest of your hike. Some of the quartz are quite massive, while the others are like little crystal-like formation. Make sure you have good hiking shoes as some of the surfaces are quite sharp. Do bring a lot of water with you as there is no much shelter especially reaching the top when the sun is so hot. You will see the Klang Gates Dam on your way up. This is the first dam in Malaysia for water supply. We also saw many species of birds, squirrels, some big ants and gibbon howling. The trail is marked by numbers sprayed on the wall so that you know how far you've got into. The trail is about 2.6 km and it can take up to 4 hours hiking the whole circuit. In our case, we turned back the same way after reaching the top, instead of continuing to the other side. As the longest quartz ridge in the world, it has its own OUV in science and geology. The forest around provides a good example of how certain species adapted to this kind of rock formation. Compare to those karst formations and volcanic rocks which are quite common around the world, Gombak Selangor Quartz Ridge is something different. So I think it deserves to be listed as a WHS. 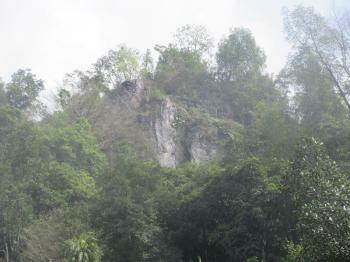 The ridge, or dragon spines as they seem to call it locally, is easily seen from the highway north of KL. Getting closer to it, as the other review already points out, is a little odd. There is a place to stop and hike up if not closed for...ever? There was even a sign of an annual marathon of sorts but I suppose the weather killed off any chance of hiking around the area for the foreseeable future. My visit was in June 2017. KL's attempt to have a WHS in the capital's area? The FRIM place is a little laughable as well. I kind of doubt I would visit this place if it opened up a proper trail, add a real parking area, have a SIGN posted for driving directions as well as actually explaining better what we are here to see, maybe even a website or something. I say "doubt" rather than "never" because the closeness of it to the capital means I might do this one day if I have a stopover or something, like 2027? Normally I'm into places off the beaten track so it could be worth a look if they can guarantee me the trail is open. The site is located on the outskirts of Kuala Lumpur but, based on my high-level check, going there with public transport may be a hassle. I went there with rental car and my GPS led me to a very strange place with parking for about three cars and teenagers laughing while taking a bath in a nearby river. I thought I got into wrong location, but after a while I found the start of trekking trail just near the parking. Unfortunately the trail was closed until further notice. Despite the warnings I entered but surrendered after 20 minutes - after heavy rains the trail is really destroyed. Based on the pictures shown on the billboard at the start the trail should be nice, with caves, shaped stones etc. 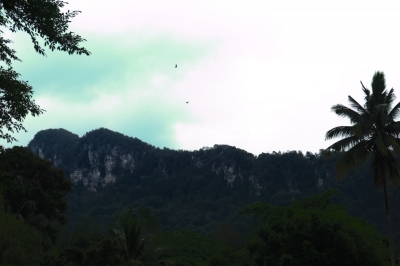 From the distance the ridge is however not spectacular at all, there are tens of better looking ones in Malaysia. Overall, I am surprised Malaysia put it on T-list in 2017 while the site is totally unprepared for tourists.